DRAft., Board up - 0' 6"
DRAft., Board down - 3' 8"
Sail area - 130 sq. ft.. 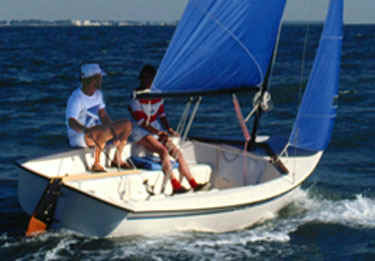 I (Jib Height) 15.20 ft.
J (Jib Width) 4.70 ft.
E (Mainsail Width) 8.90 ft.
P (Mainsail Height) 18.30 ft.
at Seat Height 113 in. Main Halyard 5/16 in. - 43 ft.
Jib Halyard 5/16 in. - 32 ft.
Main Sheet 5/16 in. - 34 ft.
Jib Sheet 1/4 in. - 28 ft..
3/16 in. - 5 ft..
Out Haul 3/16 in. - 5 ft..
Cntr Bd Pennant 1/4 in. - 62 in. Boom Vang 1/4 in. - 20 in. Shrouds 1/8 in. 1 X 19 16 ft. 5/8 in. Width 84 in. 84 in. 84 in. Length 187 in. 187 in. 243 in. Volume 282 c ft. 364 c ft. 560 c ft. Weight 390 lbs. 425 lbs. 660 lbs. Volume 427 c ft. 473 c ft. 685 c ft. Weight 600 lbs. ### 1000 lbs.